If you aren't familiar with American Boy Scouting's Eagle Scout award, it might be a little hard to explain how important this story really is. Eagle Scout is a big deal. For one thing, it takes a lot of work to get the position. A scout has to earn 21 merit badges and then spearhead a community service project that they organize and manage themselves from start to finish. Add to that the fact that most kids don't stay in scouts through high school anyway, and you end up with the award representing a relatively small and elite group. Since 1911, about 2.1 million men have earned an Eagle Scout award. And it has serious implications once you graduate high school. There are scholarships. Eagle Scouts who enlist in the military after high school can start off with a higher rank than their peers. The adult Eagle Scouts I know have told me that they've gotten interview call-backs or even job opportunities because the award was on their resumes. Basically, it's more than just this medal you pick up at age 17. For many men, it's a lifelong position—and one that demonstrates a commitment to serving others and caring for the community. So when Eagle Scouts start returning their medals to the Boy Scouts of America, that matters. Especially when these men are making this decision because they think it's the best way to demonstrate the values of being an Eagle Scout. The Boy Scouts of America bans participation in scouting by openly gay, bisexual, or transgender kids and bans GBLT adults from serving as scout masters. Legally, that's their right as a private organization. But that doesn't make it the right thing to do. 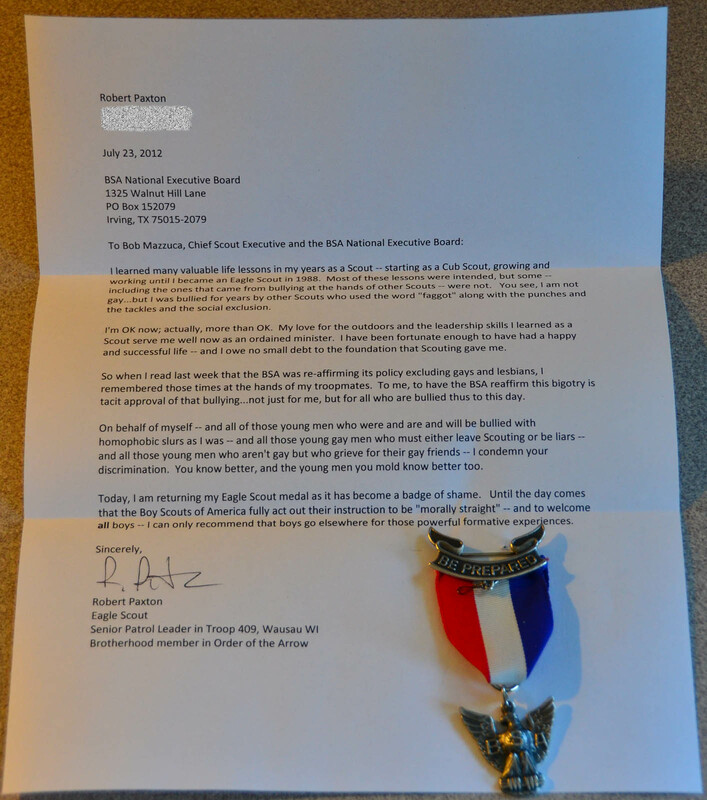 Since the BSA doubled down on that position on July 17, I've seen letters from numerous Eagle Scouts who have sent their hard-earned awards back to the organization. The letter pictured above was written by my husband, Christopher Baker. He mailed off his medal on Saturday. You can read the full text below. As a Boy Scout I was taught that ethics are important and that when something is unethical you should stand up and say something. I was taught that it is wrong to exclude people, whether based on race, physical ability or sexual orientation. I was taught that a Boy Scout stands with those being persecuted, and not with the persecutor. Banning openly gay scouts and leaders is not a neutral position anymore than separate but equal was a neutral policy on race. Gay scouts and leaders have the right and obligation to be true to themselves. Homosexuality is not a moral deviance, bigotry is. Parents’ rights to discuss sexuality with their children should not be extended to banning the participation of openly gay scouts anymore than Jewish religious practices require the banning of bacon on a camp out, or Christian Science religious practices require Scouts to forego first aid training. Today I am returning my Eagle Scout medal because I do not want to be associated with the bigotry for which it now stands. I hope that one day BSA stands up for all boys. It saddens me that until that day comes any sons of mine will not participate in the Boy Scouts. Being morally straight means standing up for equal rights and inclusion, not bigotry. I am incredibly proud of my husband, a straight man, for standing up for the equality of all people. I'm putting in links to a few other examples of this protest down below. But I know a bunch have turned up on Reddit and Facebook, and I'm sure I don't have them all. If you know of a letter that's not linked to, let me know. And if you're one of the Eagle Scouts who has chosen to join this protest, send me a photo of your letter. I'd like to post more of these, and honor the men (queer and straight) who have chosen to take their commitment to public service seriously. Finally, I think it's worth noting that participating in Boy Scouts is falling significantly. Since 1999, the total number of traditional scouts has fallen by 20%. Who knows how much of that has to do with this discriminatory policy—it's certainly not the only thing affecting membership numbers. But, at the very least, this should be a sign that setting yourself up as symbol of bigotry and exclusion doesn't make your organization grow. UPDATE: I got my first photo from a BoingBoing reader already. Andrew Reinhard earned his Eagle Scout award in 1986. He sent it back last week. I am writing in support of my fellow Scouts who are aversely affected by your announcement of July 17th. I cannot begin to express my disappointment and utter bewilderment in the BSA’s decision to continue to discriminate against Scouts and Scouters (and potential Scouts and Scouters) based on sexual orientation. I’m straight, earned my Eagle in 1986, and am a Vigil Honor member of the Order of the Arrow. I was secretary of Seminole Lodge 85. I was a guide at the Maine National High Adventure Base (Matagamon). I enjoyed some of the best years of my life as a Cub, Scout, and Explorer. Serving on the Arena Shows staff for the National Jamboree was a highlight, especially when I got to meet fellow Eagle Scout, Steven Spielberg. I have loved scouting and, had I had a son instead of a daughter, would have enjoyed seeing him learn to love the outdoors, become self-reliant, and also learn to respect his peers, all within the context of the BSA. Now I’ve changed my mind. I cannot understand the BSA’s decision. It is a stain on the otherwise exceptional reputation of the Boy Scouts of America. You and the current leadership at the national level should “be prepared” for significant fall-out from this decision. As you well know, a Scout is courteous and kind, and this discriminatory policy is in violation of at least those two tenants of the Scout Law. It is certainly not a “brave” decision. From an organization that taught me how to be a man and how to be helpful to others, what I held great pride in now carries shame. I am not alone in feeling this way. I would greatly urge the BSA to “do a good turn” and immediately reverse this decision. If the US Armed Forces can get beyond “don’t ask, don’t tell”, certainly the Scouts can do the same and attempt to maintain some semblance of honor. UPDATE #2: Leo A. P. Giannini also contacted me, and sent over a picture of his Eagle Scout resignation letter. My name is Leo A. P. Giannini. It is with great sadness that I am returning the Eagle pin and patch in protest of the BSA’s policy of "not granting membership to open or avowed homosexuals." This practice is disgraceful as much as it is discriminatory and I will not allow myself to participate in it. I earned the rank of Eagle Scout in 2005 as a member of Troop 1 in Pittsfield, MA. As a participant in Scouting for 13 years prior to this achievement, earning my Eagle Scout badge is by far one of my greatest achievements. It wouldn’t be fair if I told you what it feels like to be excluded from scouts because of sexual orientation, I wouldn’t know, and as a straight man a long way off from being a father, I don’t have a dog in this fight. I have no doubt that one day whether it is tomorrow or a decade from now The Boy Scouts of America will allow open or avowed homosexuals to join, but I cannot sit back and watch as a member of an organization on the wrong side of history. I am giving back my proudest possessions because I don’t want to have my son or daughter one day say to me, “Did you know you were a member when the Boy Scouts used to not allow gay people to join?” As an 11 year old, I remember my mother’s face contorting trying to hide the guilt after I asked her what it was like attending school in segregated North Carolina. That won’t be me. Scouting is a part of me, and what sickens me is that the organization which I believe guided me into the becoming the man I am today, has practices that go against the very principles I took from it. Scouting was more than weekend campfires, monthly trips and Wednesday snacks. As a 12 year old it was an assistant scoutmaster and his wife that came to my soccer games when my father and mother split up and my mother was incapable of attending because she was recovering from pancreatic cancer. As a 13 year old it was a fellow scout that told me life was worth living. When I was 15, I lost 35 pounds so that I could hike with my fellow scouts at Philmont that summer. In 2004, a conversation with an assistant scoutmaster from my troop convinced me I had to apply to college and in 2005 a stranger helped me with my Eagle Project; before passing away from colon cancer in 2007 gave me seed money to start a business that was eventually acquired in 2009. I’m not saying this to gloat; I’m saying this because I want to show you what scouting has done for me. At 17, after a lackluster academic and athletic career becoming an Eagle Scout was the only thing that made me in any way exceptional and different, it was the only thing that I actually ever felt I was a part of, and as a result, the only thing I was really proud of. I want you to think about what you may be doing to a kid, maybe just as screwed up as I was at 13 or an adult who just wants to give back, but can’t because ten years after he left scouts as a young man he came out. The right decision will be made whether or not if happens now, you have the chance to live and act by the principles you and every other scout I know is proud to have. I trust you will take action. UPDATE #3: Here's one from Curtis Markham, who linked to it in the comments. UPDATE #4: Here are three more letters, sent in by BoingBoing readers. 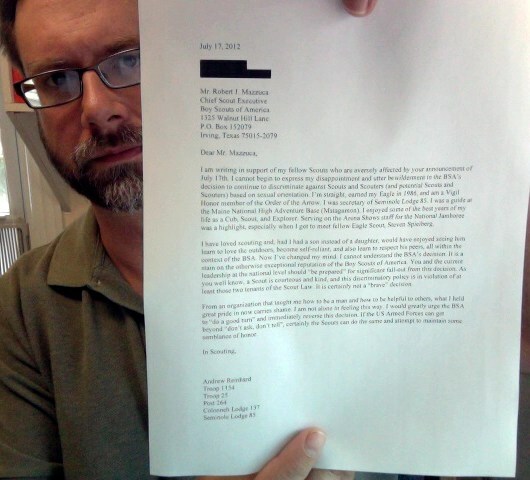 First up, a photo of the letter sent in by Robert Paxton. I am Andrew Stanton, an Eagle Scout and Assistant Scoutmaster of Troop [Redacted from public view]. I received my Eagle rank May 26, 1998. I have always been very proud of my achievement in making Eagle and I feel honor-bound to give back to the Organization that helped me so much when I was a youth. Imparting what I have learned to the next generations of Scouts and seeing them flourish in their lives has been and will always be one of the greatest gifts I could have. However, I have always felt ashamed of supporting an organization that is openly hostile to an estimated 10% of the American population who are gay. I have worked with and am close friends with several Scouts (Eagles included) whom are gay, but had to hide who they were in order to stay part of Scouting. Their reasons are their own, but I can surmise it was for much the same as mine – giving back to the kids coming through the program now; National’s policy be damned. Debating gay and lesbian friends over the benefits of Scouting versus this institutional bigotry has weighed heavily on me for some time. Now due to the recent decision by the National Council to uphold its policy on banning gays from participating or volunteering in Scouts, I can no longer support the Boy Scouts of America. I am returning my Eagle Scout rank and Order of the Arrow Ordeal sash. Until such time that the National Council recognizes the error of their decision I will not participate within Scouting as a whole. I am not the first to do this in protest and I know I will not be the last. Please do what is right and reverse this policy. Allowing it to stand only serves to hurt those whom Scouting is meant to be for – the Scouts themselves – preventing them from the benefit of knowledge from good, honorable leaders whose sexual orientation happens to differ from your own and by denying gay youth the opportunity to experience the joy and pride of becoming Eagles themselves. 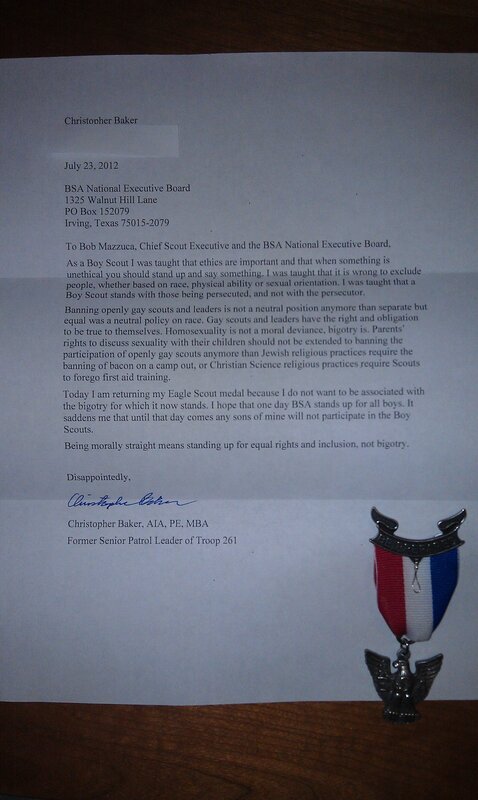 Finally, Jeff Hess hasn't posted the text of his letter to the BSA, but he does have links to several other Eagle Scout resignation letters, and he had this to say, "Today I’m wrapping up my medal and returning it to the small and ignorant men who have so dishonorably abandoned the American values that I came to understand were embodied in the honor. I no longer want to have the award in my possession." UPDATE #5: Honestly, the fact that I've had to update this post so many times is extremely heartening to me. Seriously, I am proud of you guys. And so are many other people. This one comes from reader Daniel Kane. He's not just an Eagle Scout, he's also a former Boy Scout camp counselor. Daniel says, "I'm an Eagle Scout who has been disgusted with BSA for awhile, and wasn't sure what to do about it. 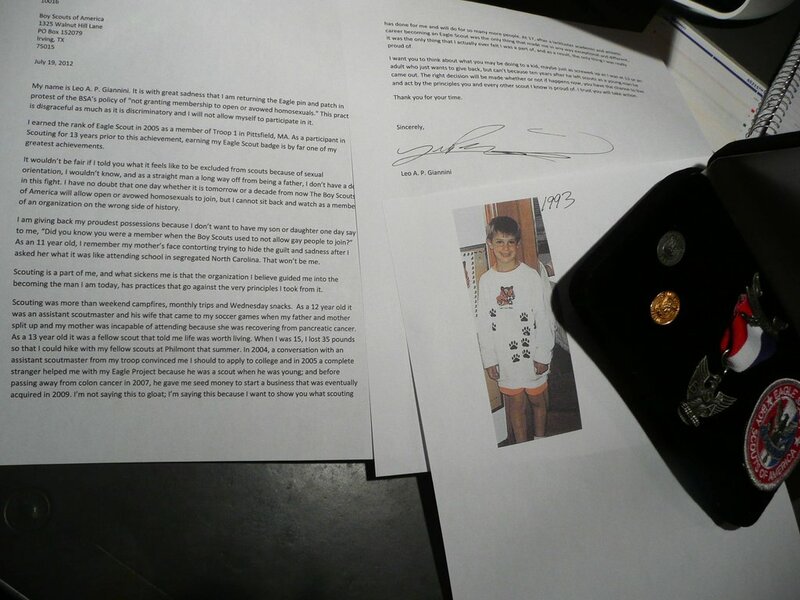 Thanks to your article, I'm mailing back my medal now." From the day I joined Troop 55, Glen Ridge NJ in November 1996, Scouting has played a major role in my life. My formative years were shaped by the Boy Scouts in powerful ways. I became a leader, because I didn’t have a choice, and because I was taught to work with others, rather than settling for being a loner. Thanks to Scouting, I became a man, something many people who are supposed to be adults have failed to do. Even nine years after I last attended meetings regularly, I can still name the Scout Laws, Oath, Motto, and Slogan off the top of my head, and still try to live my life by the ideals I learned through scouting. Many of the greatest lessons and rites of passage in my life were a result of scouting. Through my troop, I learned to trust others, but also to question them. I learned that sometimes leading is doing what others don’t want to, and sometimes it is letting them suffer from the work they didn’t complete so they become accountable. I will never forget the work I put in as a Patrol Leader and Senior Patrol Leader, or the year I was a Den Chief and earned the Den Chief service award by basically running the den because the Den Mother didn’t have time. As a scout I learned to make leave a campsite better than I found it, and from that basic lesson, to leave the world better than I found it. My first job was aquatics counselor at Rodney Scout Reservation, and I grew more in my two summers as an Aquat than any other time in my life. Although we rarely see each other now, I trust my brothers from my troop like family, and always will. As you can imagine, very few achievements mean as much to me as earning the rank of Eagle Scout. Despite the pride that I felt at that final Board of Review, I also felt a twinge of guilt. 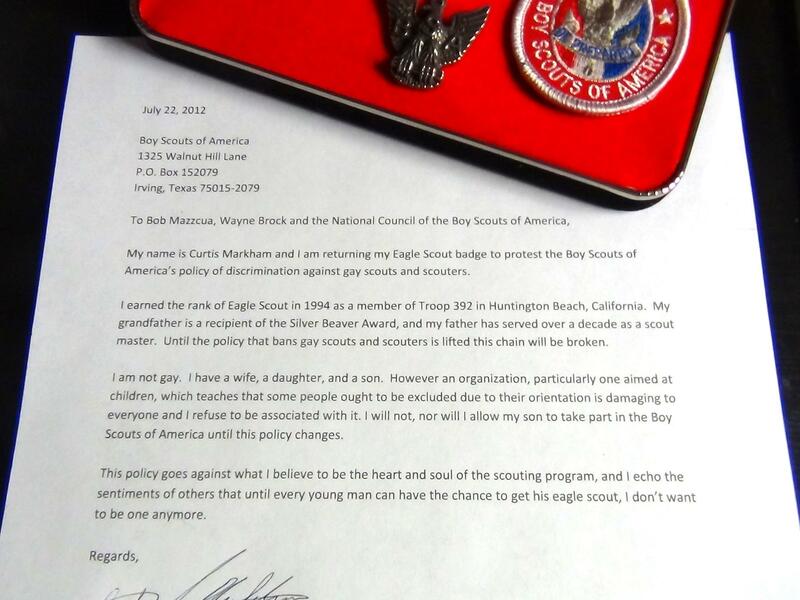 By the time I made Eagle, the Boy Scouts of America had already decided to ban homosexuals from membership. I rationalized my decision to remain in scouts despite my moral qualms. I reminded myself that my scoutmaster, in an incredibly courageous moment, had announced that he would never enforce the ban. I convinced myself that I had earned the rank, deserved it, and, since I was straight, was not breaking any rules be accepting it. Finally, I was unwilling to break away from my brothers in the troop. Therefore, I put my guilt aside, and allowed myself to celebrate what will always be one of my greatest achievements, rather than standing up for those who would never get to celebrate this moment, no matter how deserving they were. As I have grown older, however, I have not been able to conveniently ignore my conscience. Boy Scouts taught me to be brave and honorable. Because I am, I cannot be a part of an organization that discriminates. There is nothing in the Scout Laws or Oath that condemns homosexuality. There is no legal justification for treating homosexuals any differently. I know that certain religions ban homosexuality, and that the law “reverent” has been used to justify BSA’s ban of homosexuals, but many religions have no problem with the queer community, and BSA has never required its members to worship the same god, so that justification should go out the window. One of the greatest lessons I learned from my time in scouts was to work with people who were different from me, people who disagree with me. It is a skill I struggle with today, but my journey to Eagle taught me that it is a fight worth fighting, that the world is a richer place because of its diversity, and that all people can contribute something worthwhile. That is the basis of democracy. It therefore saddens me to see the organization that forced me to learn this lesson shutting its doors to people some of its leaders happen to disagree with. It is also disturbing that an organization that stresses the importance of democracy would put bigotry ahead of that ideal. Just as a petition was delivered to BAS asking for a new vote on anti- gay policy, a secret committee chose to uphold the ban without a vote. One of the consequences of democracy is living with the results, even when we do not agree with them. I do not know how I would respond to an executive board voting to continue the ban, and apparently I will never know, because a few people would rather prevent the democratic process from happening. I do know that I now have a new reason to be disgusted with BSA. Most importantly, it is my firm conviction that this nation’s greatest sin is discrimination against homosexuals. I know the Boy Scouts are not alone in this act, but the Boy Scouts are the organization that matters most to me. Discrimination is not a victimless crime. Based on data compiled by the FBI and the analysis of the Southern Poverty Law Center, homosexuals are more likely to be victims of violent hate crime than any other minority group in the United States. I am not saying that BSA encourages hate crimes, but by portraying homosexuals as deviant, BSA makes it easier for less stable, more violent people to justify their heinous actions. Furthermore, gay youth, the very people you have excluded, are more likely to commit suicide than the general population. Many suicide victims kill themselves because they feel ostracized. While you have the right to limit your membership, there is blood on your hands, whether you foresaw it or not. I do not believe that homosexuality is a sin. I do believe that discrimination is. I do believe that making a large group of young people feel less than human because of something they cannot control is a sin. I accept that I do not speak for God, and may be wrong, but even if I am wrong, Jesus Christ told us to love God and love one another. He told us “let he who is without sin cast the first stone.” By excluding gay scouts, BSA leadership is failing to love a large group of people, and continues to throw stones. Whatever deity we have chosen to follow, we can agree to love each other and not kick those who are down. I learned from the Boy Scouts to be a leader, not a follower. I learned to make tough decisions and stick with them. I have always done my best to do my duty to God and my country, and to keep myself morally straight. Therefore, it is with a heavy heart that I renounce all affiliation with the Boy Scouts of America. I will continue to use the lessons I learned from scouting in my life, and it saddens me that an organization that meant so much to me is now so strongly opposed to my value system, that my children will not benefit from the support system scouting gave me unless something drastic changes, but I will deal with that sadness. I would like to thank you for the guidance you gave me as I grew, and hope to be able to rejoin your ranks some day. UPDATE #6: Here is something for those of you who have spoken in the comments about wanting to change scouting from the inside. Zach Wahls is the young man who spoke to the Iowa State Legislature last year about his moms and why he wants Iowa to have equal rights protecting gay and lesbian couples. He's also the co-founder of Scouts for Equality, an organization made up of active scouts and scout leaders attempting to change BSA policy. It's a relatively new organization, and I'm not sure exactly what they're going to be doing to achieve this goal. For now, you can join their mailing list, sign their petition, and share your story as a scout who wants BSA to reflect values of equality and inclusion, rather than discrimination.